Badminton Galaxy: Review of the book "Pullela Gopichand - The World Beneath His Feat"
Review of the book "Pullela Gopichand - The World Beneath His Feat"
Nicely written book. It talks about the amount of effort he and his family spent so that he continued his effort on badminton. How he came across badminton is also mentioned in the book. Some of the other points noted from the book are the very poor and bad attitude of Indian Government towards sports and sporting infra-structure which we even see today. I remember the number of times I had to go to my sports teacher's office to get a barrel of shuttle which any would be very old outdated shuttles which would break on couple of shots! We have so much talent to beat the world but our government does not care much about it. This book speaks volume of his return to Badminton after a very bad knee injury. The journey of recovery from knee injury, to winning All England Championship is nicely detailed. The commitment in Gopichand is commendable. Overall a good read for any Badminton lover. The 2001 All England semi-final match between Peter Gade and Gopichand has been one of my favourite and I keep watching it again and again (http://www.youtube.com/watch?v=7ru9V5FPeiY). The way he kept Peter Gade guessing all through out the match is super tremendous. It was great to read about what was going through Gopichand's mind during these games. The description of the final of All England Championship is wonderful. 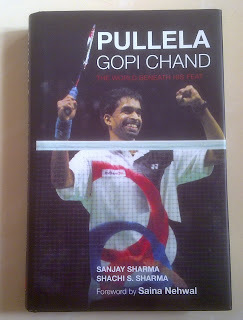 Gopichand is one of my favourite sports person, so it was a wonderful read for me! Someday I am hoping to lay my hands on the book "Dare to be a Champion" by Lee Chong Wei! :) That sure would be a great read as well like this one.